Title: Your B&B or Mine? Former soldier Logan Park is haunted by memories of his own. Some are of his best friend. Other are filled with longing for the girl he could never have. Now Savannah is back, and their attraction can’t be denied. But Logan has already sacrificed everything to atone for his sins, and there’s no way he’ll let himself fall for a girl who might never love again. I finished Your B&B or Mine in one day. 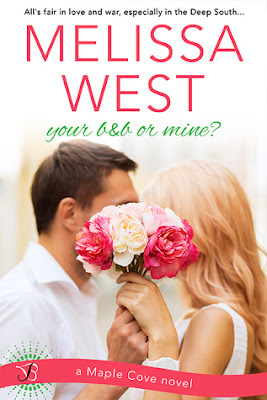 Melissa West writes fantastic romance. I love the characters she creates, the boys especially. I already want to read it again just thinking about it. I’m so excited for more in this series. I don’t know which will be next Leigh? Jack? I’m kind of hoping Jack. Maple Cove reminds me a bit of Gilmore Girls. The small town where everyone knows your business and is very leery of change. I really want to go to the bakery, my mouth was watering reading about that part. It was fun to have the setting be a small town and the majority of the action revolving around the family B&B. I’m guessing the series will branch into different parts of town if it’s going to continue to be about the Hale siblings. I loved Savannah because she is a successful business woman. Sometimes I feel like I read too many books sometimes where the main female lead is down on her luck job wise. There is one particular part where Savannah yells at Logan about assuming that her work doesn’t need her. Maybe they are actually compassionate. I was like ya you go girl. I’m personally fortunate to have a job and bosses that are understanding about family so I know how that goes. Melissa is very good at creating a strong woman who you can relate to. Logan, oh Logan. I loved him right off the bat and of course with Melissa’s masterful way of creating sizzling romance, he is not easy to resist. I like that he served terms in the military and his survivor's guilt is a good issue to touch upon because that happens not just with veterans but with many people. Savannah is the perfect person to pull him out of it being that she was Will’s girl originally. So understands Logan in a way other people can’t, besides there is a history there. The romance is absolutely perfect. I loved the push and pull between Savannah and Logan, which is what made me finish this book in one day. Such a great romantic read that made me smile and want to see it as a movie, or a mini-series, or a made for tv movie. Something! I also go into a Melissa West book knowing I’m going to get my money’s worth in that respect. So I could gush all day. Why are the reviews for the books you love the hardest? I just want to say read it. READ IT! I loved it so much. One of my top Romances and I’m so excited for the rest of the series.